I have so much fun when I art with friends, in person or on the net. That is how Artsy Fartsy Friendly Fun got started! 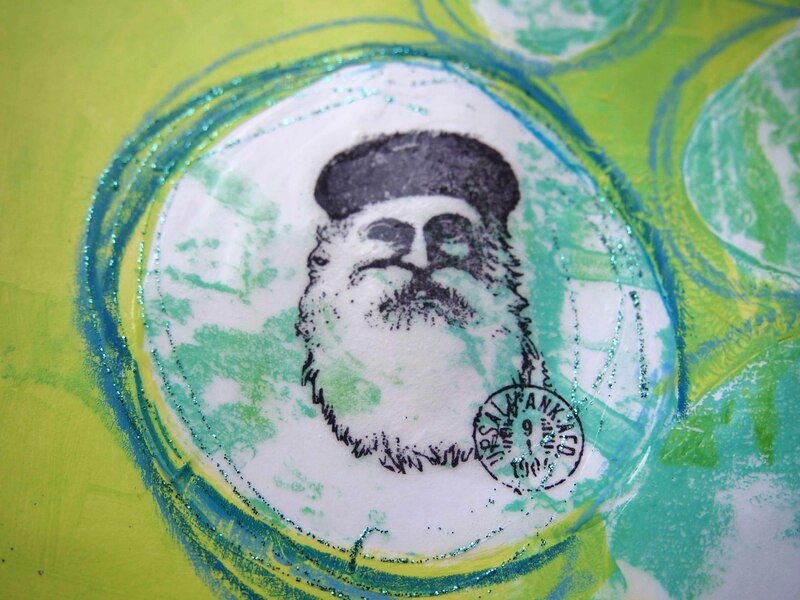 While working on this week’s Artsy Fartsy challenge I was struck by how much fun I was having with my Gelli Plate. I have heard from little elves that a few people might be getting one from the jolly man in a red suit so why not plan a time to play? 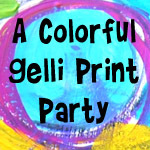 Come and join me for a play day or two at my Colorful Gelli Print Party! Everyone is welcome! 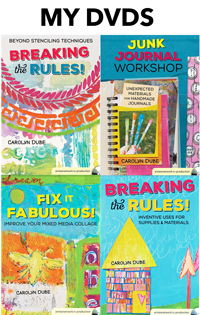 The party begins Jan. 1st so we can kick off 2013 with lots of color and creativity! 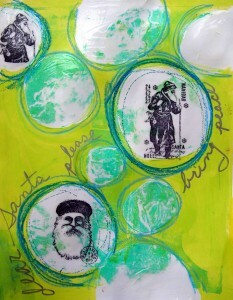 Jan. 1st through Jan. 7th, each day I will have a new Gelli plate post! 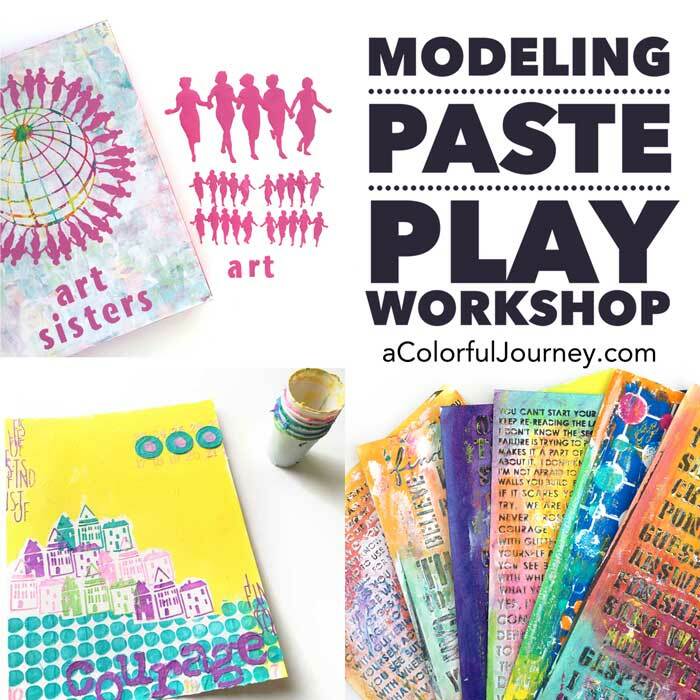 The best part will be a link party so we can all see what each other is making with their Gelli Plates! 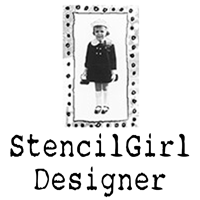 All Gelli creations are welcome! 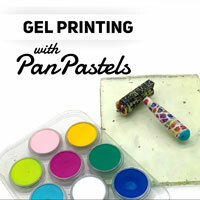 Now, on to the art that was sparked by the Gelli plate! Every Artsy Fartsy has 3 elements that must be incorporated some how. This time it was a Santa, a non-traditional color scheme, and tissue paper. 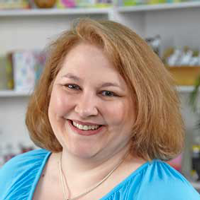 As soon as I get this posted, I am off to see how Maria McGuire used these same 3 things! This ghost print from my Gelli plate jumped out of the drawer and onto my counter. Okay, it grabbed my eye and I put it on the counter. 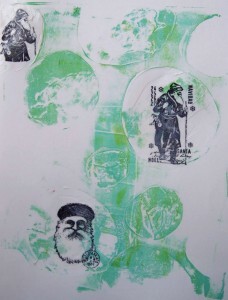 I stamped a variety of Santas on white tissue paper. Once I had the ones I liked out came the gel medium. A few water soluble crayon scribbles with quick circles of glitter glue. I added a bit of writing. I would love it if Santa would bring peace with him this year. There is too much violence and pain for so many families. May all those touched by the violence heal and find peace. Want more creativity? Check out Maria McGuire’s Artsy Fartsy post , Creative Every Day, Anything But a Card, Make It Monday, Inspire Me Monday and Show Me What You Got! Peace….yes Santa please! I love the Glossy Accents touch and how you focused on the Santas (which I love that were on tissue) by painting around them. I have to say my favorite part is the glitter glue–it somehow adds that holiday spirit! Thanks for another FUN Artsy Fartsy my friend! I love those Santa images! The nontraditional colors are gorgeous! .. and “pop” the do. Keep the “puns” coming. Blogs and humor must go together. Wow! I’ve never seen this technique before. Love the how it turned out, Carolyn. Pretty unique. Thanks for sharing the how-to. So glad I caught this project on MIM#120. I love the way you incorporated the Santa! 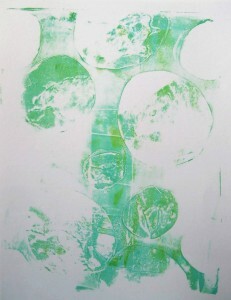 The circles are so cool and I love your processes! Awesome! Beautiful post — in message, color, images and everything else! I will be at that party – you betcha! Wow, we DID use the same Santa stamp. It’s the only one I own. Of course, yours is SO much more colorful and fun. Love it. 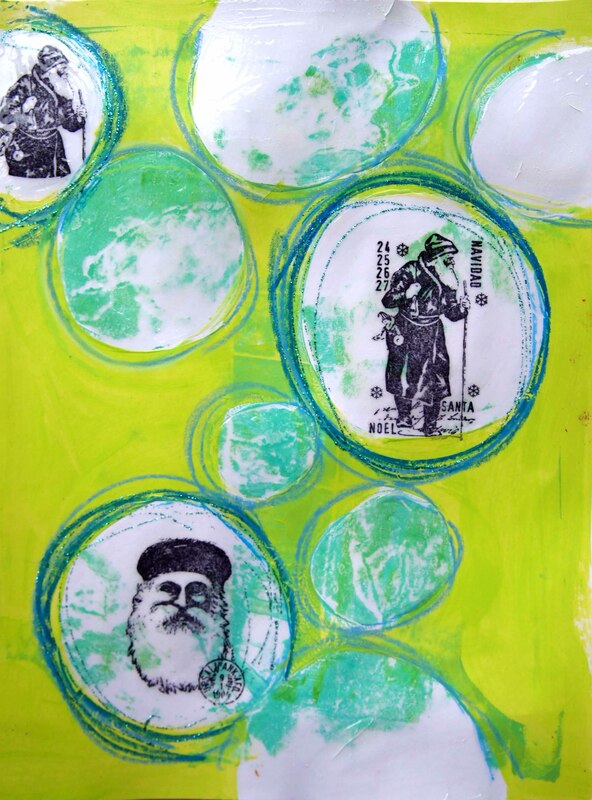 I live in the Netherlands, Europe and I have a gelli plate. I love the work I see on it and I would love to join in. I love your santa works, the way you explain and the colors are complementary to the usual. Love it! Thanx! Happy holidays and lts of fun! Sounds like it’s going to be a great start to 2013 welcome back to SMWYG! I’m game for fun in the New Year! My Gelli Plate is so lonesome for me recently… too much grief lately – let’s have some fun! I like those !!!! !’s too! 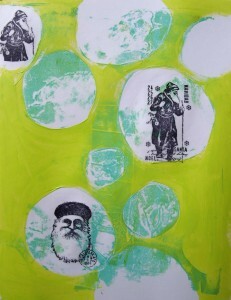 carolyn, i love this piece with the bright colors and varied santas. i have a question though. how did you get the green background and still keep the integrity of the blue design? If I am understanding your question- I just brushed a coat of green paint that was somewhat translucent so the blue below peeked through. A fab piece of art – love the bright colour contrasted with the black and white images. Thanks for sharing your creativity at MIM this week. I saw your brilliant creation on MIM. It’s fantastic and very inspirational to me because I have not done anything like this before myself. Love this unique holiday page. The images in the circles are some of my favorite stamps. They work really well in the circles too. And I am with you in what you wish Santa would bring. We could use it. Beautiful: colours, images, and the words in your post. Love it all. Thanks so much for joining in with the Anything But A Card challenge this time. This is beautiful like usual! I will be Gelliplating with you in January! Merry Christmas and lots of great things in 2013 to you and all! Checking your blog today led me here. I love the stamping on white tissue! Did you then cut the tissue circles out or place a whole tissue page over your green and paint blue all around the circles with Santa? I will be joining you for the gelli days, my first use of my small gelli plate! I cut the tissue paper out – gluing down a whole sheet of it would have led to lots of wrinkles the way I glue. 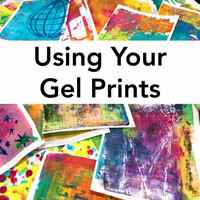 So glad you’ll be joining in the Gelli fun!